It was money and mollycoddling that ruined the banking industry. We don't need a review of Banking Culture, we need a review of Regulatory Culture. A review into whether bankers are Paid, Praised, and Promoted too much for doing the wrong things? And how they treat whistleblowers telling on these wrong things? What's not to like? Was this FCA U-Turn due to road blocks raised by banking lobbyists and their little helpers in government? 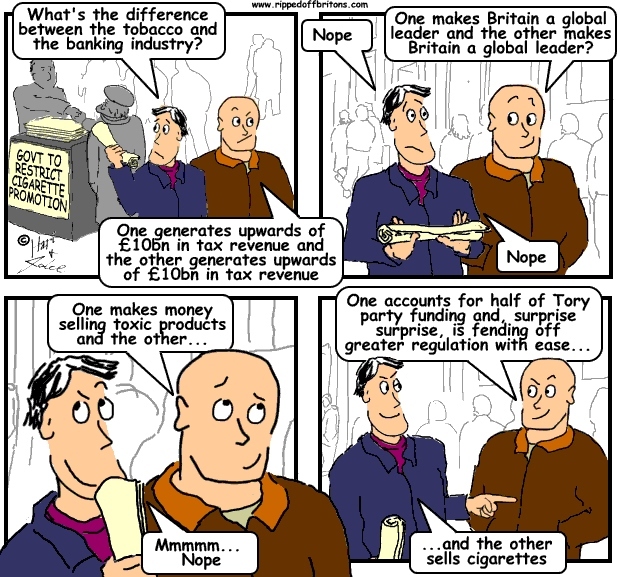 Or is it a realisation that the bankers are not responsible for their misdeeds. A realisation that bankers are suffering too, suffering from Affluenza? A realisation that the real cultural problem is actually somewhere else? “Affluenza” is an affliction brought on by having too much money. The Affluenza Defence pleads that the malefactors have so much money and are so molly-coddled they can’t tell right from wrong. The defence attorney asserts the poor rich things, brought up by weak indulgent guardians, earnestly believe money can make any problem go away. Therefore, having been deprived of a conscience due to this surfeit of cash and lamentable guardianship, the affluenza-afflicted individuals can’t be held responsible for their acts. The fault lies not with the perpetrator, but with the money and the carers. It is a defence successfully deployed to avoid retribution on both sides of the Atlantic. "During the sentencing phase of Couch’s trial, a defense expert argued that Couch’s wealthy parents coddled him into a sense of irresponsibility – a condition the expert termed “affluenza”. " In the UK wealthy bankers get away scot free for mischief resulting in a reckless intoxicated (by bonuses) crash that caused The Great Recession. Their fines paid by shareholders (collapsing shareprice and dividends) and customers (higher profit extraction). The bankers had been in trouble before this crash and got themselves into trouble again after it, convicted of various frauds and scams including LIBOR frauds, Payment Protection Insurance (PPI) scandals, Interest Rate Swaps Agreements (IRSA) scams, and more. Clearly a deeply ingrained cultural problem. But, following the Affluenza argument, perhaps not among the bankers. Like spoiled children around the world, the British banking industry has learned by repetition they can get away with anything. Once their guardians have got past all the scolding and finger wagging, they quietly pour water over their reforming zeal, put away their punchy pronouncement, and everyone carries on more or less as before. 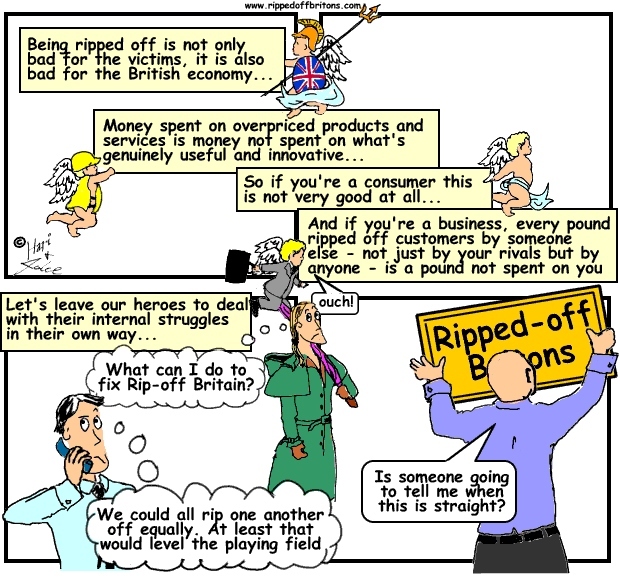 The grim truth is ripping off people is legal in British law. Consumer protection legislation states so long as the ‘average consumer’ is not cheated just about anything goes. The ironically named Office for Fair Trading even provides a helpful flowchart, to ensure even the most weak witted merchant will understand what their ripping-off rights are. In the simplest of terms the flowchart shows the above "average consumer" is protected, the below average is not. Most things in nature follow the Normal Distribution, which means half the population is 'below average' and so is fair game. Annotations in RED are by us. The “Culture Review” of bankers was cancelled not to protect the bankers. It was cancelled to protect the guardians – the regulators, the courts, and the law makers in Parliament. Not because it would expose their powerlessness in the face of bankers' reckless greed and ruthless lobbying, but it would reveal something far worse. It would have revealed to all us ripped-off Britons that the banking culture is absolutely in keeping with the culture in ripped-off Britain. "Britain's biggest banks have been accused of covering up a set of potentially damning reports into their culture and ethics. The new Banking Standards Board (BSB) examined the behaviour of ten institutions in the run-up to Christmas. When this information was shared with the banks they were urged to make it public – but three months later not one has published its results. The alleged cover-up comes just months after City watchdog, the Financial Conduct Authority, sparked outrage by scrapping a probe into Britain’s banking culture."